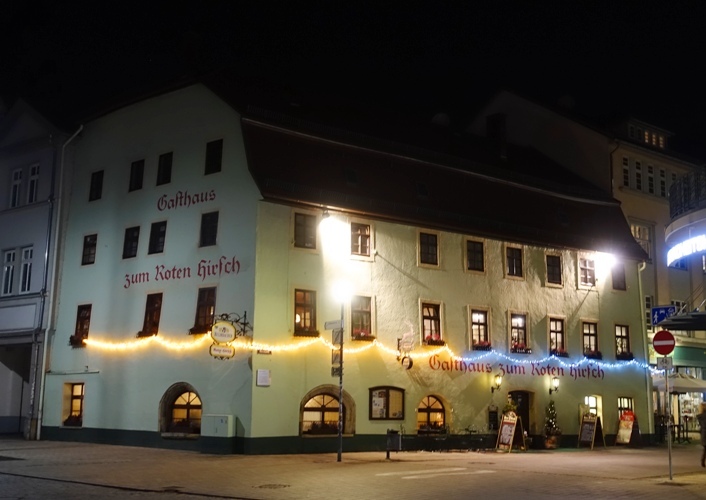 Tonight I wanted to visit another of my favorite restaurants in Jena. I tried over the weekend to eat there, but it was too crowded. Since the shops are open late for holiday shopping and the Christmas Market is in full swing there are a lot of people out and about downtown. It is very cold this evening and when I first stepped inside the Roter Hirsch my glasses fogged over and I had difficult seeing. However, I soon found that all the tables were full. I was about to leave when one of the servers suggested I share a table with a couple of older men who are regulars there. I decided that I could still have a fairly quiet dinner while sharing a table. One of the men was a retired dentist and had some English skills. He told me that he learned English 60 years ago when he was in school. With my limited German and their limited English we had a little bit of conversation. The server brought me an English menu, and I actually had a little trouble finding what I wanted as I knew what I wanted from the German menu. I started out with a nice cup of Soljanka with some toast. 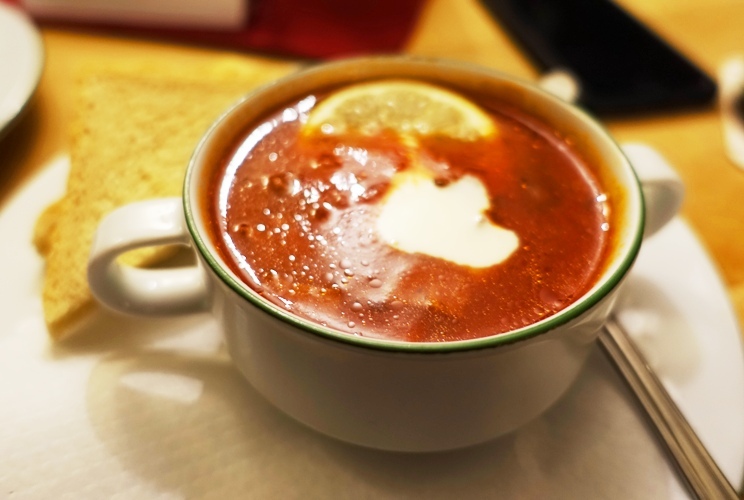 This soup is from Russia and is sour and spicy. Since this area of Germany was heavily influenced by Russia, it is a common starter at a restaurant. Here the tools are ready for the main course, which is another of my favorite foods from this region of Germany. Here is my Thuringer Rostbratchen. 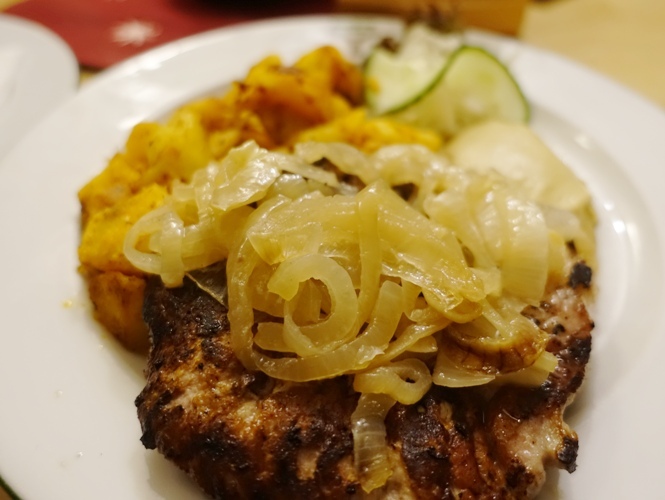 It is basically a pork steak that is served with roasted potatoes, grilled onions and some wonderful spicy German mustard. Here is a view that shows the potatoes a bit better. It was a wonderful meal as it always is at the Roter Hirsch. You can tell why they have been in business for over 500 years. It was a nice dinner and good company despite the language barrier. We didn’t even exchange names, but I did get an invitation to join them again during my next visit to Jena. 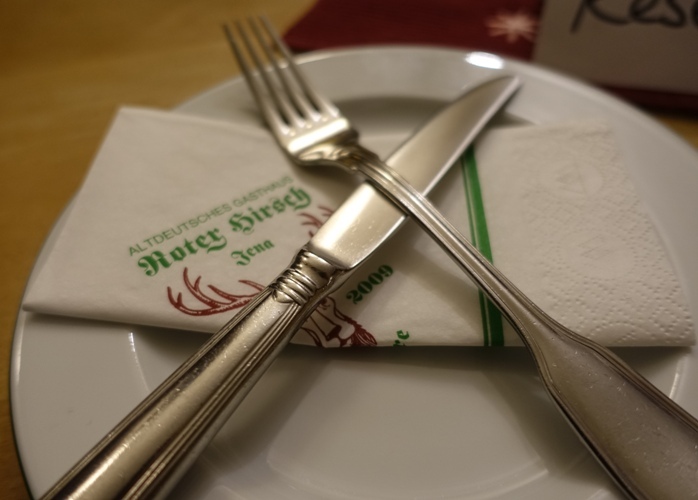 They spend a lot of time at their corner table, and I have seen them there several times over the years I have been eating at the Roter Hirsch. It will be a pleasure to join them again. 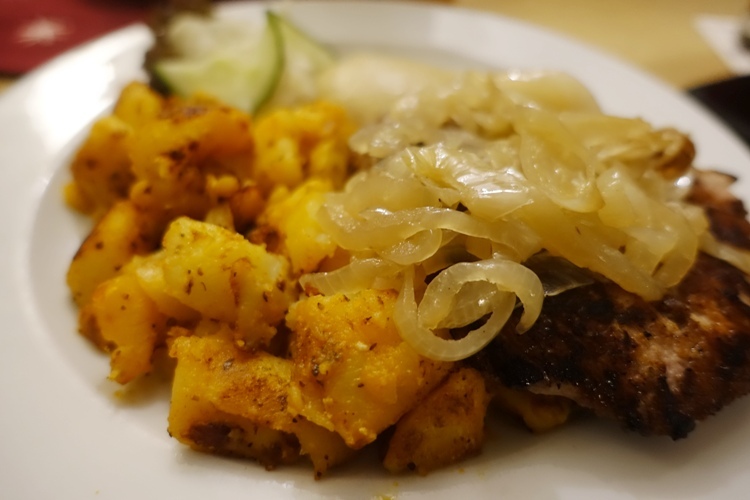 This entry was posted in Culture, Food, Germany, Memories, Travel and tagged German Food, old restaurant, Pork, Potatoes, Roter Hirsch. Bookmark the permalink.